A seemingly benign conversation on the couch on a Saturday afternoon, while a child naps in the next room, has the power to break a family apart. But Christmas being only a week away, Frederika and Henrik don’t want to go into details about their separation before they’ve properly celebrated the holidays. Come January, they are faced with the painfully mundane tasks their decision sets into motion: they have to establish the genealogy of each object in the house, classifying everything as “yours” or “mine”. Weeks are broken into days and hours in a complicated chart that defines who is entitled to spend their time with their daughter. When the first days of spring arrive, two shaky shadows move out of their shared home. Frederika has to learn how to live a new life: How to fill her days when she’s alone in her new apartment? How to get through difficult moments alone with the child whose life has also been shaken? When she’s alone, Frederika relentlessly dissects her relationship with Henrik. She finds herself questioning whether it is actually possible to live in a family, and whether a total love is feasible. At times, she feels she is on the verge of losing her sanity. A story from the past plays out parallel to Frederika’s narration: a young woman named Julia walks the city, carrying a notebook, a pen and a cosmic mission in her mind to save the world by telling everything about everything. Her two sisters, one being a younger Frederika, do all they can to save her. Riikka Pulkkinen’s novel The Children’s Planet radiates the same honesty and clarity as the writings of Joan Didion and Joyce Carol Oates. In her novel, she engages with current feminist discussions on family, motherhood, and love. 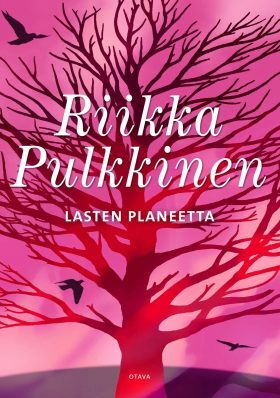 Riikka Pulkkinen is among the very best authors in our time depicting female experience. Her sixth novel The Children’s Planet tells two stunning stories of women whose reality breaks down and who are forced to start building a new life. The Children’s Planet bravely crosses the conventionalities of the traditional divorce novel and essentially seeks out the moral, intellectual and emotional preconditions of life in a situation familiar to many of us: a free fall when our life has lost its balance and we can’t find stable ground under our feet... Riikka Pulkkinen investigates human existence in the spirit of Jean-Paul Sartre and Albert Camus. The Children’s Planet combines an entertaining reading experience with an insightful depiction of our era and downright poetic language that produces exhilaratingly insightful, larger than life crystallizations from, among other things, motherhood and the burden of ethically sustainable life... Riikka Pulkkinen's novel offers multifaceted reflection that gives food for thought for several rounds of readings. Riikka Pulkkinen skilfully captures the great dimensions of one small word... (Her) sixth novel is about a couple separating, but at the same time it ponders other ways to separate, the fragile edges of separating; What’s healthy, what’s sick, what’s wrong, what’s trying hard enough, what’s giving up, what’s real, what’s imagined... The Children’s Planet is an exceptionally multidimensional book in the true sense of the word. Separation has never been described as beautifully from a child’s perspective and as honestly as now... Pulkkinen has a frantic need to prove herself and her readers that a different kind of separation is possible. That a couple, who cannot and does not want to live together, can nevertheless remain in each other’s lives. (The novel) describes the different stages of separation with touching and strikingly precise observations. Nobody has ever written a book like this about divorce. If there is one writer who is capable to deal with such a difficult topic in strong literary prose, it is Riikka Pulkkinen. She always strikes me with her unique talent to tell stories about people struggling with very real and recognizable issues, and to address these issues with very clear and accessible philosophical questions.